THIS SATURDAY is the 2nd Annual SASS Fest is one-day event that promotes locally made art and skill-sharing, which includes an arts market, discussions and workshops. Schedule of events will be listed on the SASS FEST Facebook Page. ARTS MARKET includes art & crafts, vintage goods, jewelry, ‘zines, prints, & more. WORKSHOPS include how to make a zine, print making, menstrual health, sobriety support & discussion, writing, photo developing, and more. 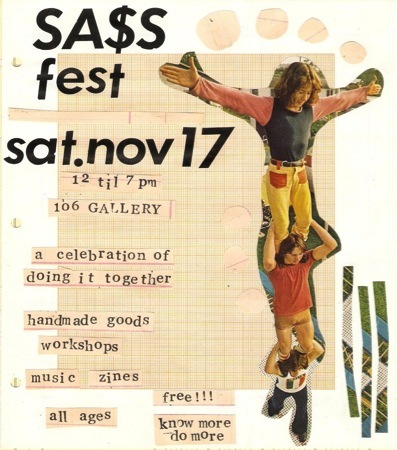 SASS Fest is at (106) Gallery, 12 – 7 PM. This entry was posted in (106), Events, Grand Rapids. Bookmark the permalink.